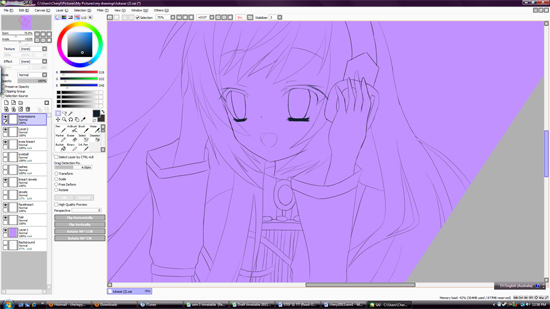 Lineart; looked like Shana. 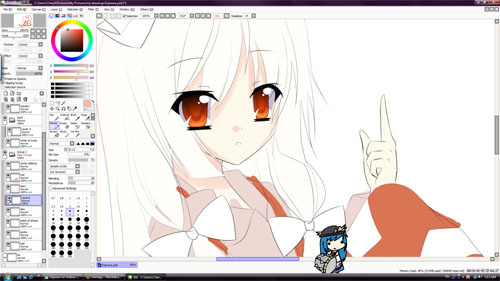 Hai thar Tenshi-chan <3 I hate drawing long hair because it takes 100x the effort than short hair to draw. 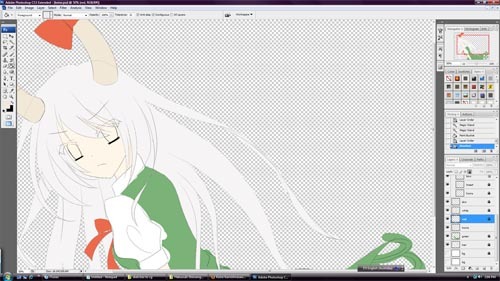 Base colour stage; starting to get annoyed because lines were too thin, and the magic tool didn't pick it up so I had to manually fill in the empty gaps. DOLL OF HOURAI FUJIWARA NO MOKOU ILY LOL. 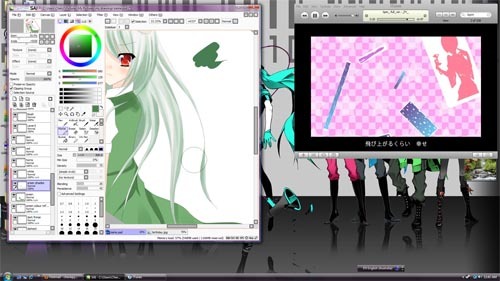 Only screenshot I have of her~ Tenshi Tenshi. I entered the draw to win tickets to the Oprah Show, but I didn't win (obviously) ;A; It would have been nice to go-- I could have gone out today to the Opera House to go catch a glimpse of her. I'm not too good with crowds though, and camping out in the sun~ but watching her on TV now having fun in Australia makes me PTBA. Poor Hugh Jackman -_-; At least it shows he's real. Namie-kun is finally releasing her much awaited Touhou artbook! It features guest artists I love such as luluseason, myhilary, KD, pcmaniac88. The only guest artist I haven't heard of it isxelle (I don't watch them, but their work is very pretty too). It's more expensive than I would have thought, but this item is more rare than the pixiv quarterly... want badly!! *hyperventilates* adf;lajd Oh wait, I noticed I've already seen the guest art pieces from KD, pcmaniac88 and myhilary- I kinda wish they didn't post it. 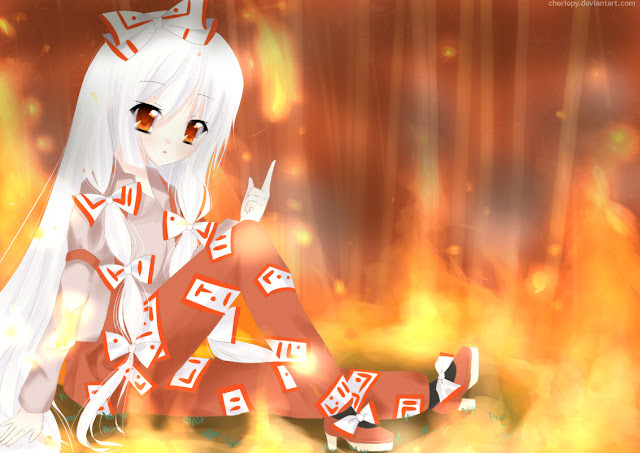 I was wondering why KD didn't post that picture of Reimu I had for my desktop for the past month on dA. 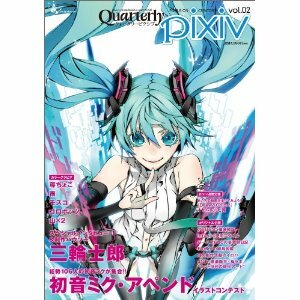 Dhiea's artbook... also want... 1000yen is a good price I think. As a ranking artist, and all her works she's drawn from 16-18 (so basically now). I'm going to ask if my friend if he likes her (he's going to Comiket!!). If only I had loads of money and a credit card. Oh yeah, of course that picture is bookmarked on my pixiv. ARRRGHHHH 127 pgs of inspiration. That or a hair straightener that works. Hmm, there is much else that I want. Maybe the new MCR album? I've been asking my dad to buy me shares for the past x number of months/ years and he always says 'Yes. Do your own research.' I just want something stable I can get a little bit of return from in ten years. 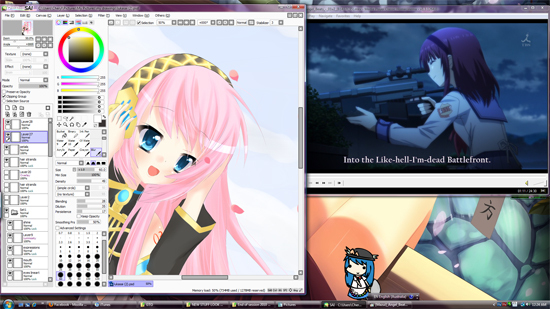 Yesterday I went K with some anime friends and we sang so many VOCALOID songs ahhhh. 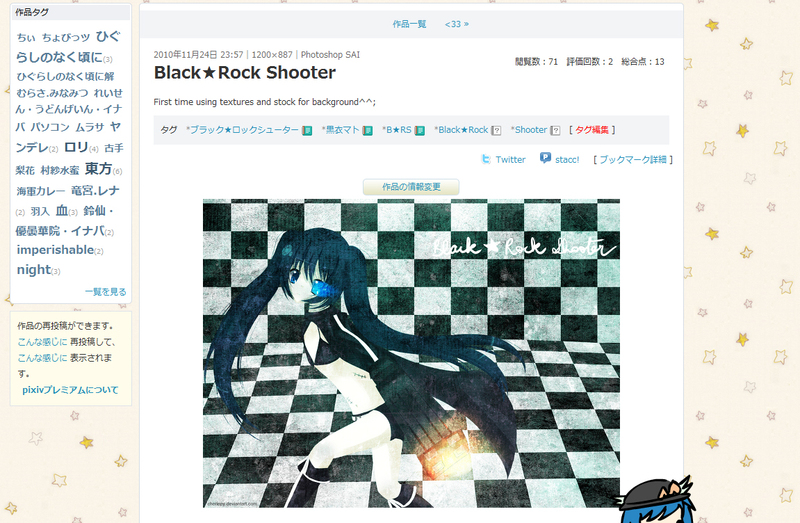 Also submitted a different version of Black Rock Shooter on deviantart. I drew in the star on her clothes, changed a little bit of the shading in her hair (not that you can tell) and gave the cannon some blue so now it looks more purple rather than red. Hmmm, yeah. I sat down at 3pm and got up at 7pm. Then I sat back down at 10.30pm until now to finish. If I didn't dawdle around with it so much... I think this took around 5 hours in total? I've said this many times before, but I say it again; I HATE CLOUDS DAMN YOU. Ahahahaha, so many views, so little points in one minute. Time for bed. I'm not feeling 100% at the moment. Time to fix the picture before second submission. Hai thar Miss Tenshi's head. I'm bad at it. Maybe that's why it takes me so long to cg. Importing and exporting between SAI and Photoshop is driving me crazy! SAI crashes if I open CS3 along with it, so I always have to close it. 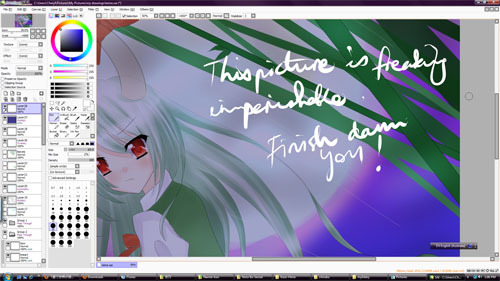 If that wasn't annoying enough, I always have to open CS3 around 5 times before it detects pen pressure! Progress pics of cging from the last few days (lines= 5 hrs? I had to change her hair SO many times. Also her eyes, I did it three times. And the decoration on her chest took me a long, long time). 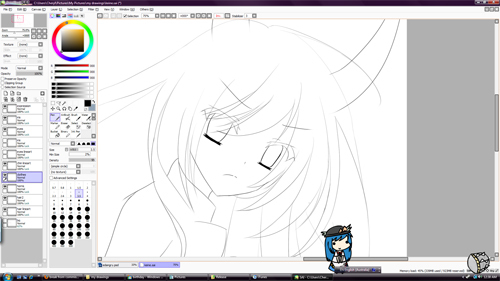 First I lineart my sketch with the pen tool in black (or brush tool in CS3). Then I check smoothness of the lines over a darker colour (easier to see gaps idk why). Here I've added in the other shades, but the gold looks like it needs to be darker since I changed my layer to a special effects layer on SAI. I probably need to fix the hair highlights and stuff. 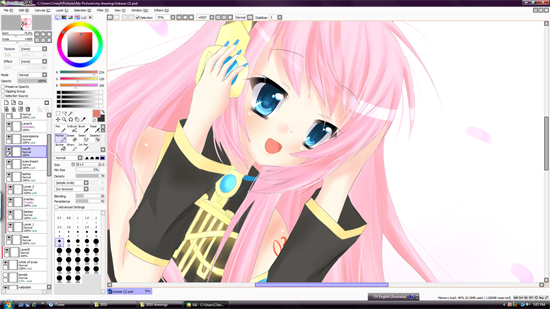 I also need to soften/ blur the shadings for the hair together. 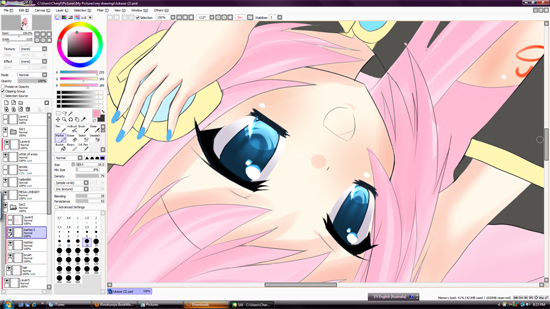 If you compare to the last pic, I've erased a bit of the skin shading so it doesn't look as harsh. I added in a little background plan-- so it's very likely going to be petals. 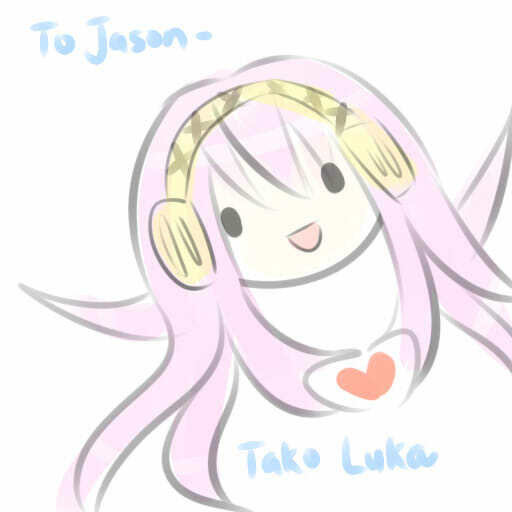 Megurine Luka FTW. I didn't end up softening her hair... but I made a crappy bg to go with it. I fixed the gold and the shading in her hair. You can't really see the difference here. Oh well. I drew new petals. After another two months, this picture is closer to completion! Added in some effects and background in photoshop and finished first level shading. 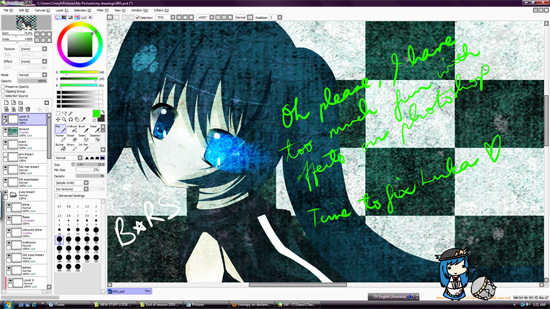 The effects are so distorted I'm thinking BRS doesn't need much more deeper levels of shading. Moe imouto bye bye T_T My secret place to get high resolution Noizi Ito-sensei scans. But I'm quite amused to see it turned into 'oreno.imouto'. Banner picture = Ore no Imouto ga Konna ni Kawaii Wake ga Nai. Will start studying for Japanese after Glee. Just logged into pixiv to check-- ZOMGGGG people really like the Higurashi picture... only 30 points, but 119 views in less than two weeks. Keep in mind I only had 1 watcher when I posted that picture.So far, after two months and a week or so, and being submitted to a group, that same picture has 198 views^^. I'm not too fussed, it's just that I'm amazed by how differently fanart (by an unknown n00bie gaijin) gets treated on a strictly Japanese site compared to a full English speaking person who has watchers on deviantart.